F.E. Olds and Son, Inc., herewith referred to as Olds, warrants this instrument as described above to be New, of First Quality, and free from defects in material and workmanship for a period as described below. Please read this Warranty in order to understand its terms; should you have any questions, please call or write directly to Olds. Should your new instrument acquired though your Olds Authorized Dealer, after date of original purchase, be found by Olds to have a defect in material or workmanship, Olds, at its option, will repair or replace the defective part subject to the following specific conditions. This WARRANTY is limited to the person who originally acquired this instrument, whether through purchase, purchase on approval, or school or institutional lease only, from an Olds Authorized Dealer. A. WOODWINDS: Plastic clarinets, oboes, and piccolos. The plastic body is warranted for ten (10) years from the date of purchase. If, within this ten (10) year period, the plastic body breaks for any reason other than malicious destruction, misuse, accident, or improper maintenance, a replacement joint will be supplied free of charge. Springs, pads, felt parts, corks, tuning barrels, bells, mouthpieces, reeds, normal wear and tear by use are specifically excluded from this Warranty. All other parts not listed herein are warranted for ten (10) years . NOTE: If transferal of keys is required to a new joint by reason of warranty, purchaser shall pay the cost of the key transfer. B. WOODWINDS: Wood clarinets, oboes, piccolos, and bassoons. If a wood body cracks other than by misuse, accident, improper maintenance, or malicious destruction within 6 months after date of purchase, Olds will replace it free of charge. Cracks occurring between 6 months and up to ten years after date of purchase will be repaired. Springs, pads, felt parts, corks, tuning barrels, bells, mouthpieces, reeds, normal wear and tear by use are specifically excluded from this Warranty. All other parts not listed herein are warranted for ten (10) years . 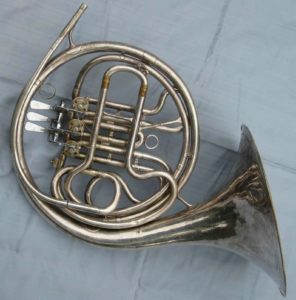 C. BRASS INSTRUMENTS: Trumpets, cornets, trombones, fluegelhorns, mellophones, french horns, baritone horns, tubas, sousaphones, and including saxophones, flutes, piccolos, and drums. Olds warrants that the lacquer, gold, silver, nickel, or chrome finish on this instrument is of first quality and workmanship. Olds does not warrant against deterioration caused by perspiration acid, corrosive atmosphere, or other external causes including modification and damage while being used. fiberglass parts are guaranteed against cracking for ten (10) years providing that such warranty does not apply in the event of misuse, accident, improper maintenance, or malicious destruction. Springs, pads, felt parts, corks, tuning barrels, bells, mouthpieces, reeds, normal wear and tear by use are specifically excluded from this Warranty. All other parts not listed herein are warranted for ten (10) years . D. PERCUSSION: Snare drums, snare kits, bass drums, trios, quads, quints, and drum sets, orchestra bells, xylophones, vibraphones, marimbas, and chimes. Olds warrants against wood shell cracking, bars splitting other than through misuse, accident, improper maintenance, or malicious destruction for ten(10) years. Olds does not warrant finishes on pearls or plated parts , bars or tubes against deterioration and/or discoloration due to corrosive atmosphere, modification, alteration, careless use, or malicious destruction or damage. Heads, sticks, mallets, slings, snare strands, cases, frames, wheels, normal wear and tear by use are specifically excluded from this Warranty. If re-pearling and/or transferal of hardware is required by reason of warranty, purchaser shall be charged accordingly. All other parts are warranted for one (1) year. Olds will be the sole judge as to causes of damage or defects and be responsible for repair. The repair of this instrument shall constitute a settlement in full of all claims of the purchaser for damages, and shall operate as a release of all claims for damages resulting from accident, misuse, modification, alteration, or tampering. This warranty excludes all incidental, special, exemplary, or consequential damages. Some states do not allow the exclusion or limitation of incidental or consequential damages, so the above limitation or exclusion may not apply to you. All shipping and insurance charges for the instrument requiring warranty service are to be paid by the instrument owner. Olds will not be responsible for shipping damage resulting from improper packaging of instruments returned to Olds. If the instrument is defective in workmanship and/or materials, call (908) 233-5354, or write Olds, Warranty Service Department, P.O. Box 2669, Westfield, New Jersey 07091 for a RETURN AUTHORIZATION form and instructions for returning the instrument. Upon receipt of instructions and a RETURN AUTHORIZATION form, owner should ship the instrument, prepaid and insured, to Olds, 1100 Globe Ave, #2, Mountainside, NJ 07092, or other such place as Olds may authorize. Owner must include a note with the instrument describing the defect and giving owner’s name and address along with a copy of the invoice, receipt, or other document establishing the date of purchase. IMPORTANT: No Warranty service shall be performed by Olds unless a REPAIR AUTHORIZATION has been issued and proof of purchase has been received by Olds. Repairs done by other than the original manufacturer, or by unauthorized persons, will invalidate all warranties.